Patients are at the heart of Oklahomans for Health’s mission. A caring grassroots group of activists started OFH in 2014, and we continue to relentlessly pursue our promise of protecting SQ788 and helping to regulate our program in an ethical professional manner with our legislatures. We need your help to continue our efforts. What a great way to memorialize the Oklahoma grass roots effort that made medical cannabis legal then to have your very own, “The Cannabis Constitution of the State of Oklahoma“. Made by Lawrence Pasternak in collaboration with Chris Moe. All proceeds go toward our legislative actions to help protect what we all voted for..SQ788 is about the patients! 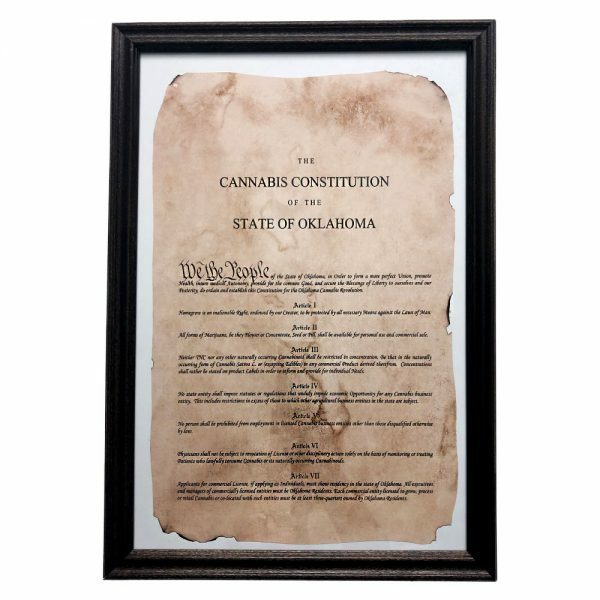 The constitution is printed on 12×18 inch paper with hand made burnt edges to give the document an old vintage look housed in a hand made wood frame that will look beautiful in any home or office!